Asbestos was used as a building material in the 60s, 70s and 80s because of its chemical and heat resistant properties. But it can be a killer and the safe disposal of it is of paramount importance. Asbestos can be found in a variety of places including roofing and wall claddings, pipe lagging, vinyl floor tiles, textured paints and insulated heating systems. 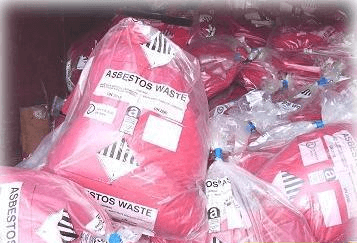 If you have the expertise required to remove the Asbestos in your home for yourself then we can collect it for safe and comprehensive disposal. We do, however, discourage people from tackling asbestos themselves due to the potential health problems exposure to asbestos can cause.